Nebraska ASCD Conference Facilitated by Jenn Utecht November 8, 2010 Equipping Adolescent Readers: Instructional Strategies That Boost Student Achievement. 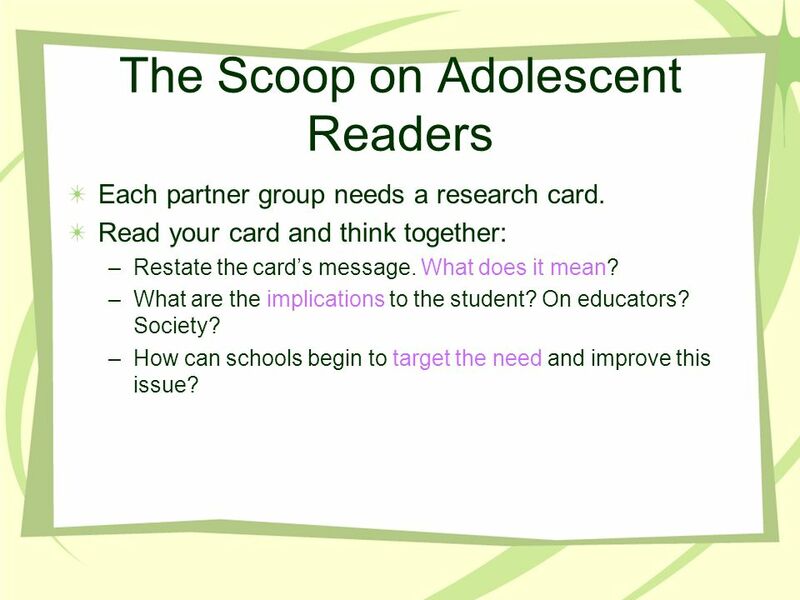 2 The Scoop on Adolescent Readers Each partner group needs a research card. Read your card and think together: –Restate the cards message. What does it mean? –What are the implications to the student? On educators? Society? –How can schools begin to target the need and improve this issue? 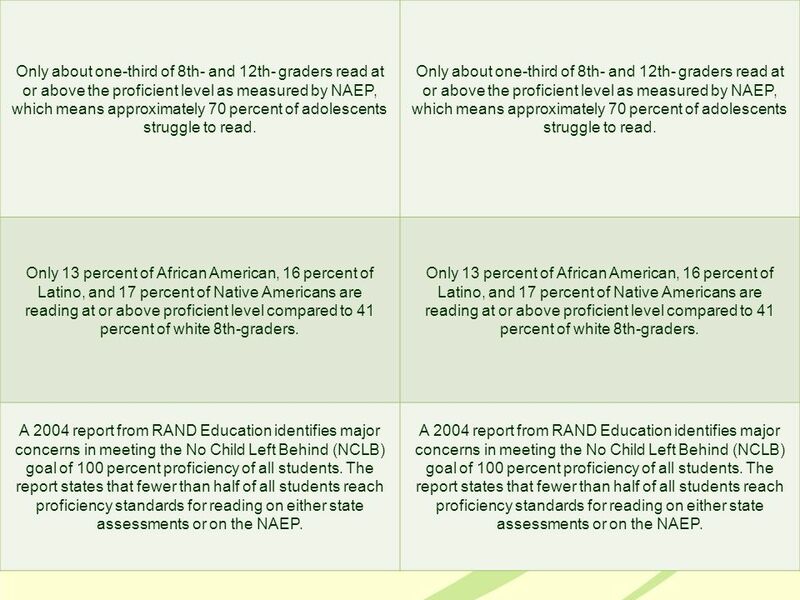 3 Only about one-third of 8th- and 12th- graders read at or above the proficient level as measured by NAEP, which means approximately 70 percent of adolescents struggle to read. Only 13 percent of African American, 16 percent of Latino, and 17 percent of Native Americans are reading at or above proficient level compared to 41 percent of white 8th-graders. A 2004 report from RAND Education identifies major concerns in meeting the No Child Left Behind (NCLB) goal of 100 percent proficiency of all students. The report states that fewer than half of all students reach proficiency standards for reading on either state assessments or on the NAEP. 4 In the face of stiff competition for jobs and markets, more than 80 percent of American businesses complain that high school graduates lack adequate reading and writing skills and spend more than $60 billion per year to bolster employees basic competencies. Only about 32 percent of high school graduates are adequately prepared for college, and of those who matriculate, more than half must take remedial courses. U.S. 11th graders have placed close to the bottom, behind students from the Philippines, Indonesia, Brazil, and other developing nations, on international comparisons of performance on reading assessments. 5 About 1.3 million students nationwide drop out of school between 8th and 12th grades. Only 68% of 9th- grade students complete high school on time with a regular diploma. 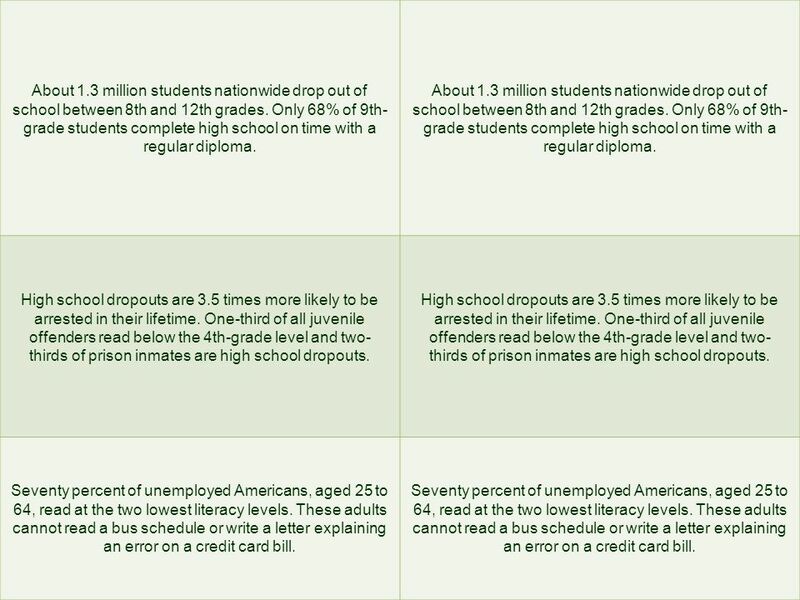 High school dropouts are 3.5 times more likely to be arrested in their lifetime. One-third of all juvenile offenders read below the 4th-grade level and two- thirds of prison inmates are high school dropouts. Seventy percent of unemployed Americans, aged 25 to 64, read at the two lowest literacy levels. These adults cannot read a bus schedule or write a letter explaining an error on a credit card bill. 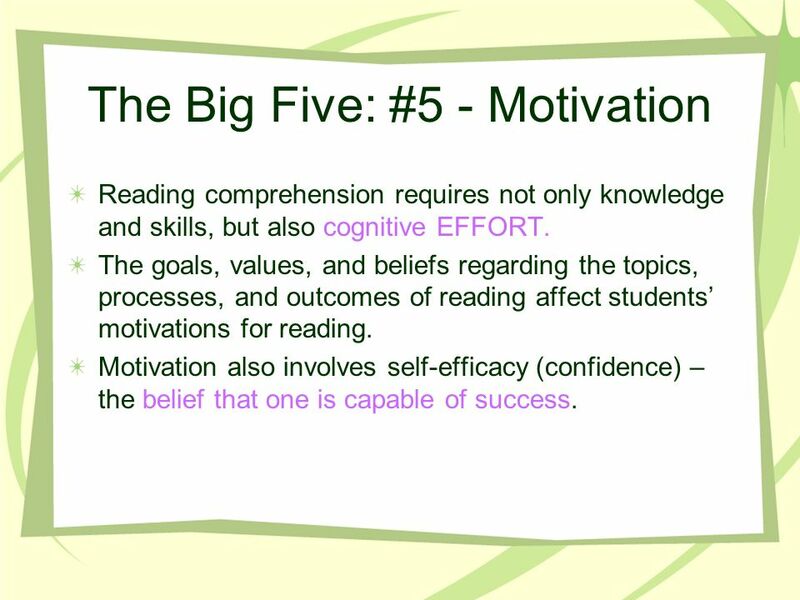 8 The Big Five: #5 - Motivation Reading comprehension requires not only knowledge and skills, but also cognitive EFFORT. 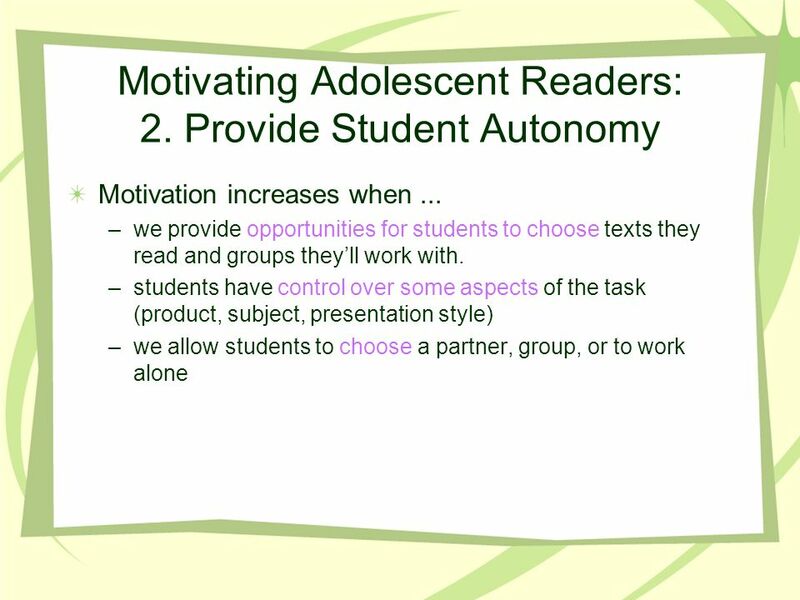 The goals, values, and beliefs regarding the topics, processes, and outcomes of reading affect students motivations for reading. Motivation also involves self-efficacy (confidence) – the belief that one is capable of success. 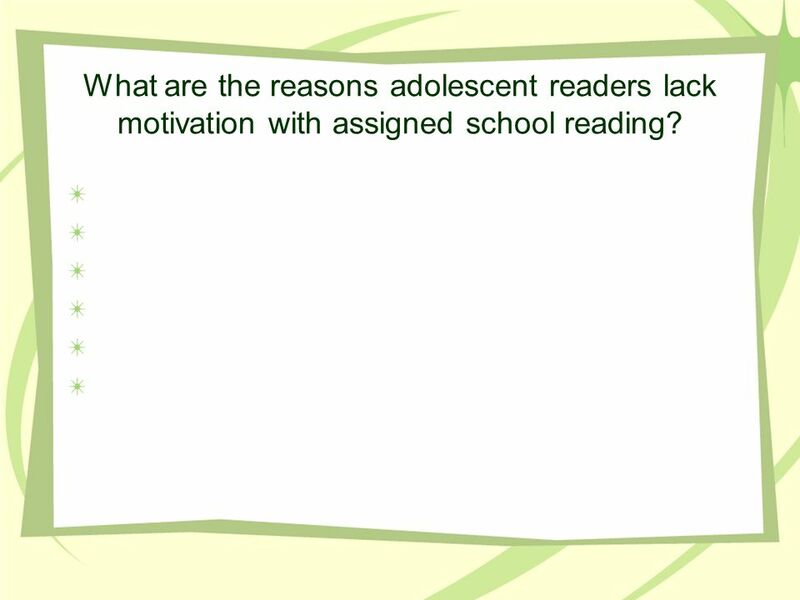 9 What are the reasons adolescent readers lack motivation with assigned school reading? 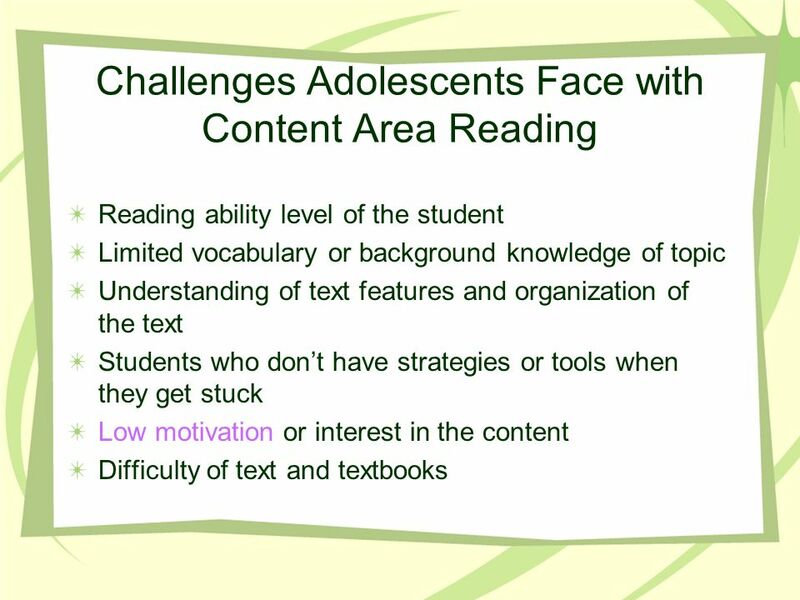 10 Adolescent struggling readers often lack motivation to read. 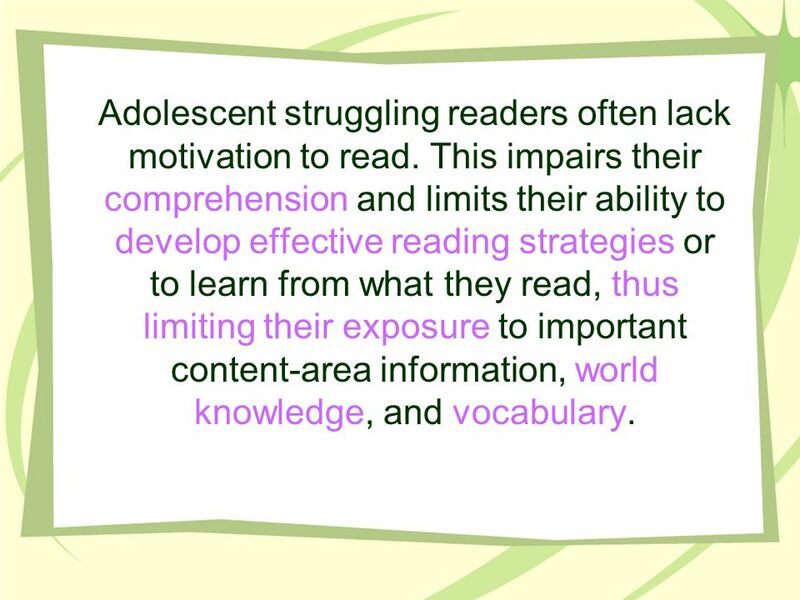 This impairs their comprehension and limits their ability to develop effective reading strategies or to learn from what they read, thus limiting their exposure to important content-area information, world knowledge, and vocabulary. 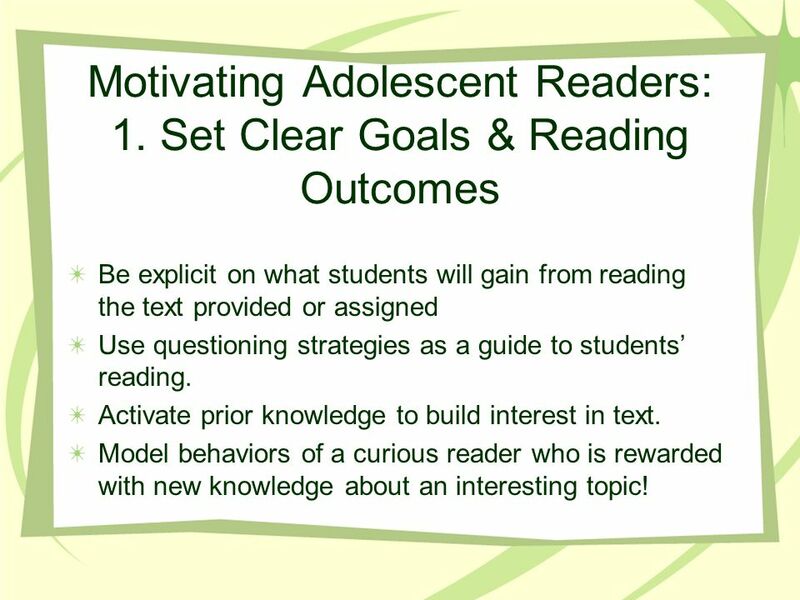 11 Teaching Tools for Increasing Motivation in Adolescent Readers 1.Set clear goals and outcomes for each reading task. 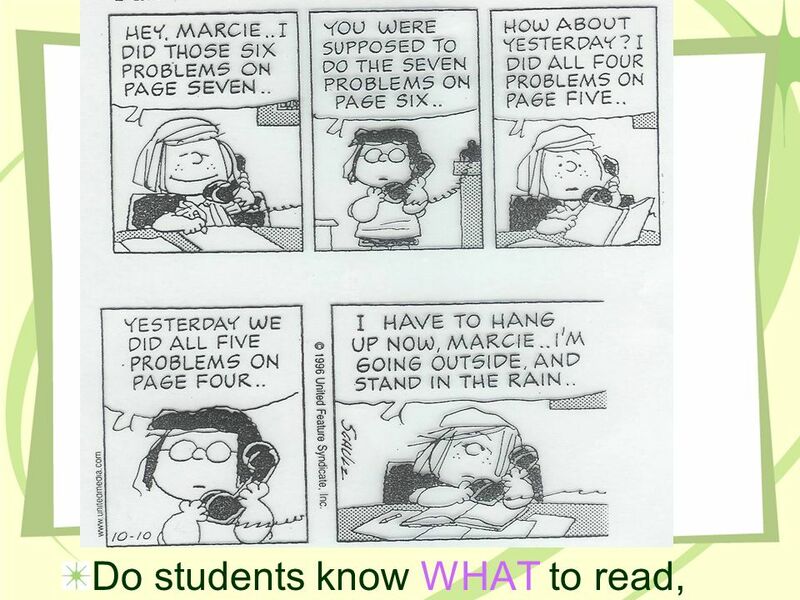 Make sure students understand what information theyre reading for! 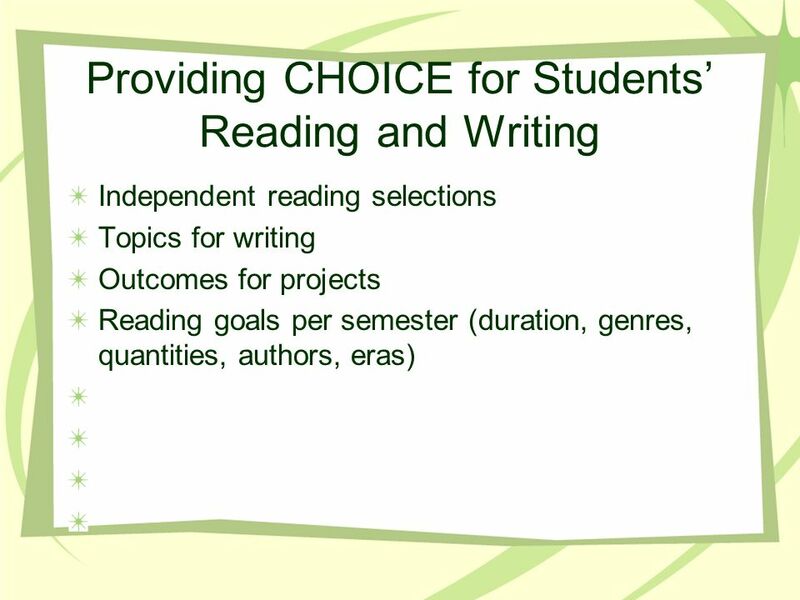 2.Invite variety and student-choice in reading materials. 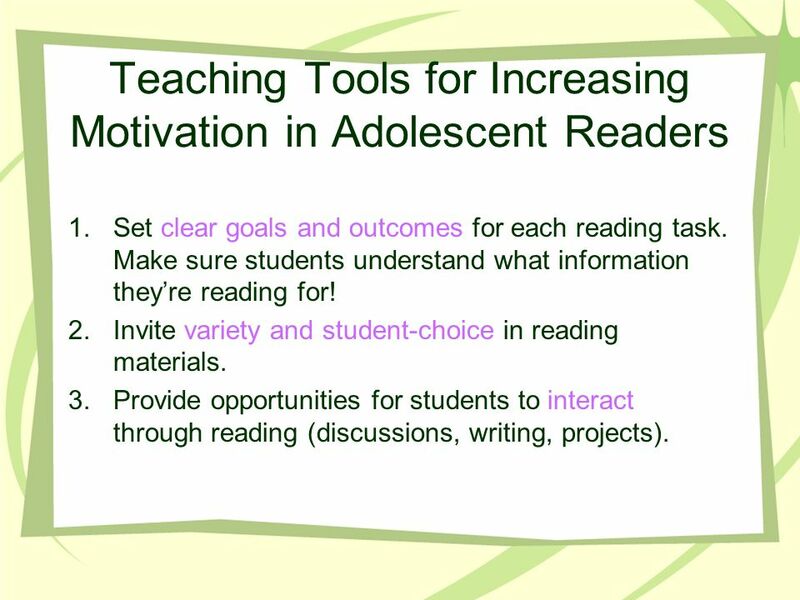 3.Provide opportunities for students to interact through reading (discussions, writing, projects). 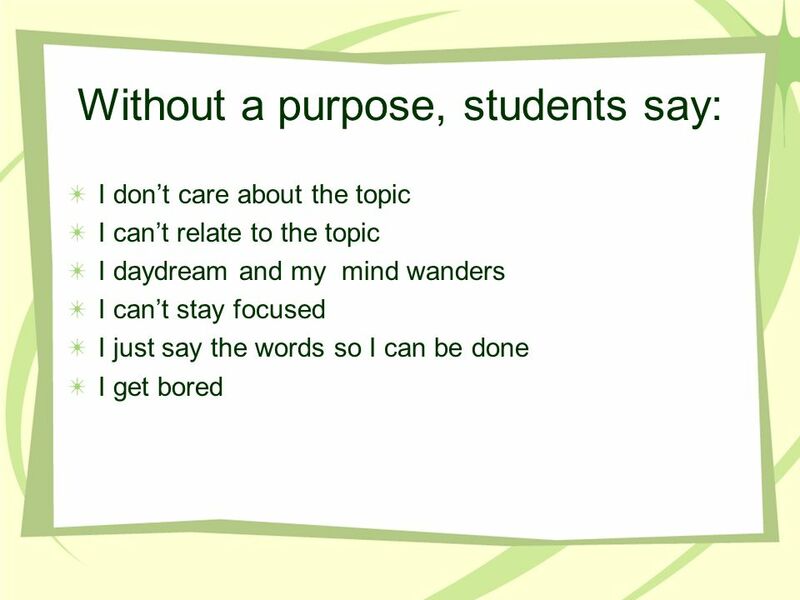 12 Do students know WHAT to read, and WHY? 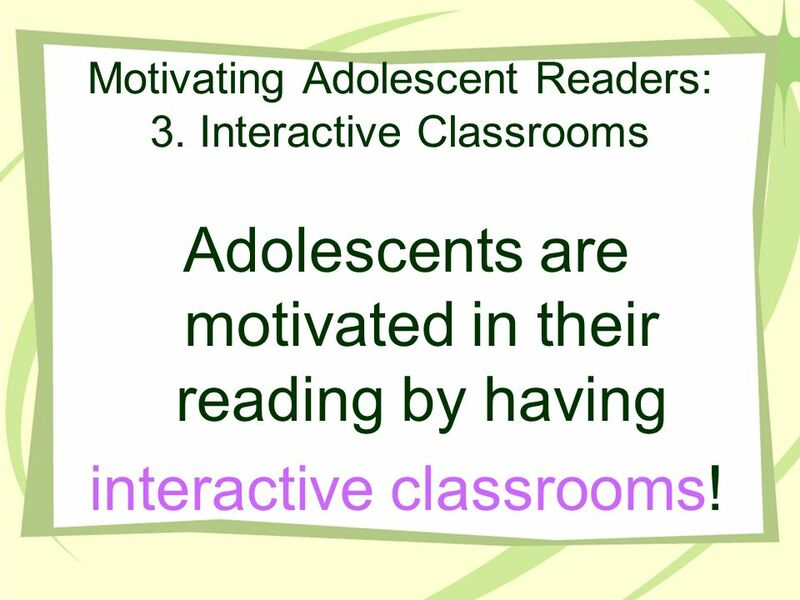 13 Motivating Adolescent Readers: 1. 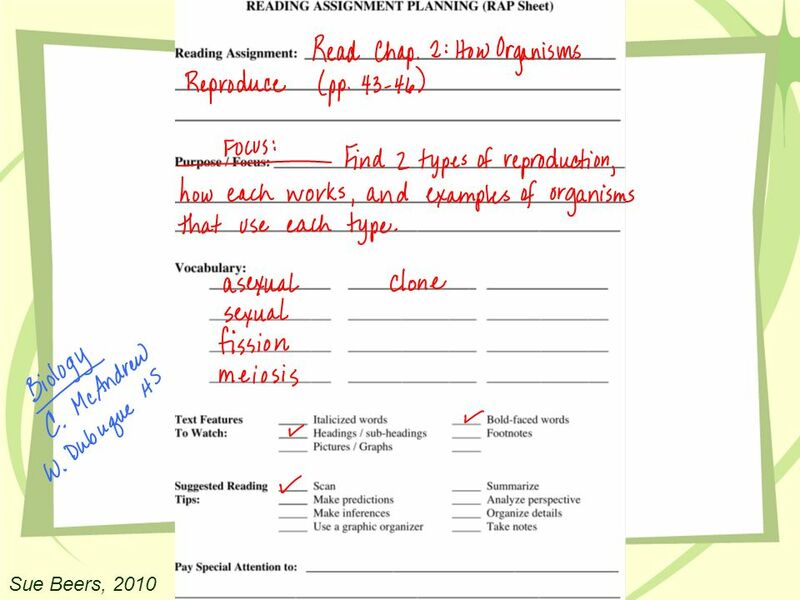 Set Clear Goals & Reading Outcomes Be explicit on what students will gain from reading the text provided or assigned Use questioning strategies as a guide to students reading. Activate prior knowledge to build interest in text. Model behaviors of a curious reader who is rewarded with new knowledge about an interesting topic! 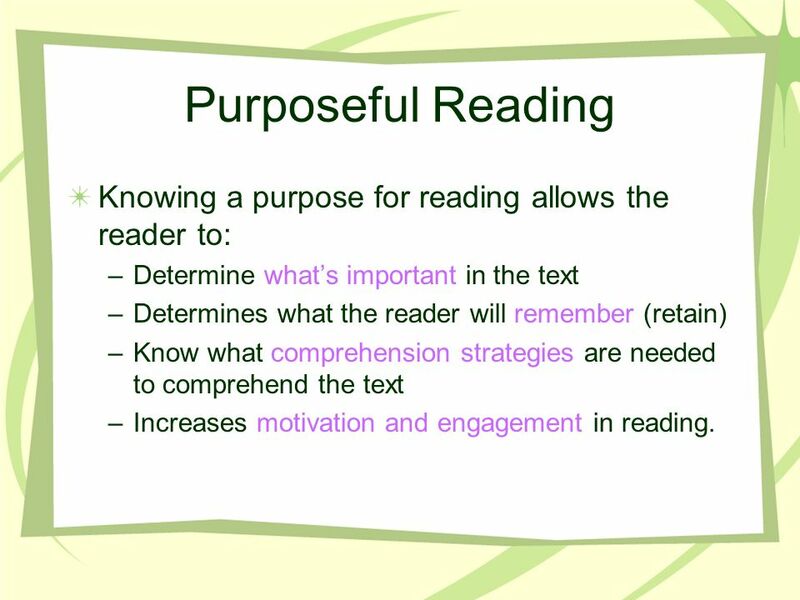 14 Purposeful Reading Knowing a purpose for reading allows the reader to: –Determine whats important in the text –Determines what the reader will remember (retain) –Know what comprehension strategies are needed to comprehend the text –Increases motivation and engagement in reading. 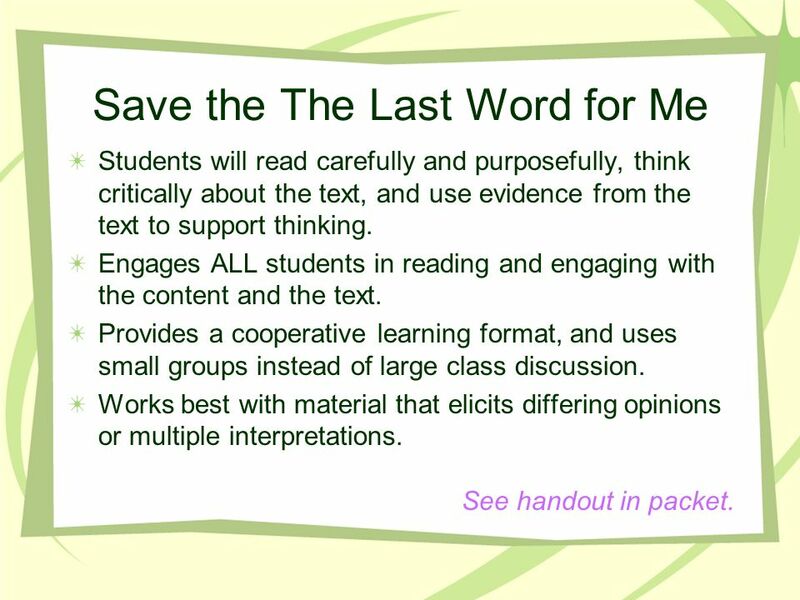 22 Save the The Last Word for Me Students will read carefully and purposefully, think critically about the text, and use evidence from the text to support thinking. 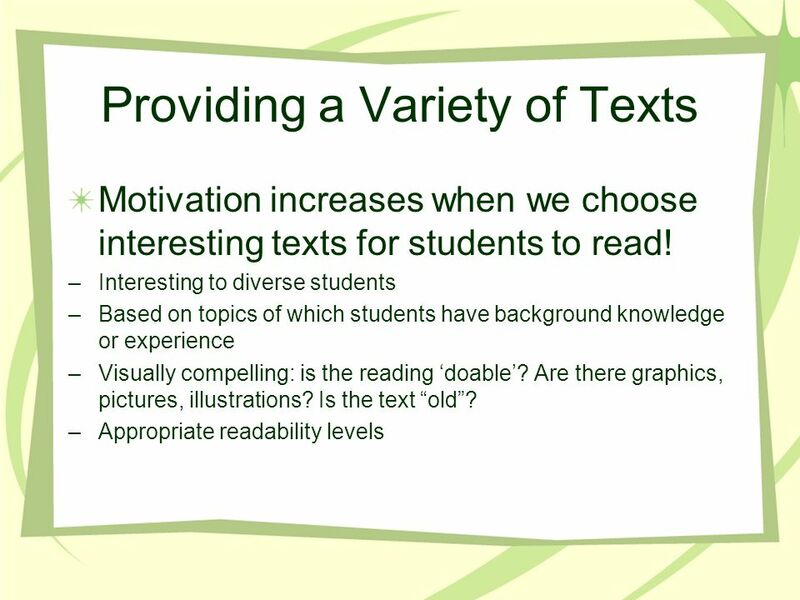 Engages ALL students in reading and engaging with the content and the text. 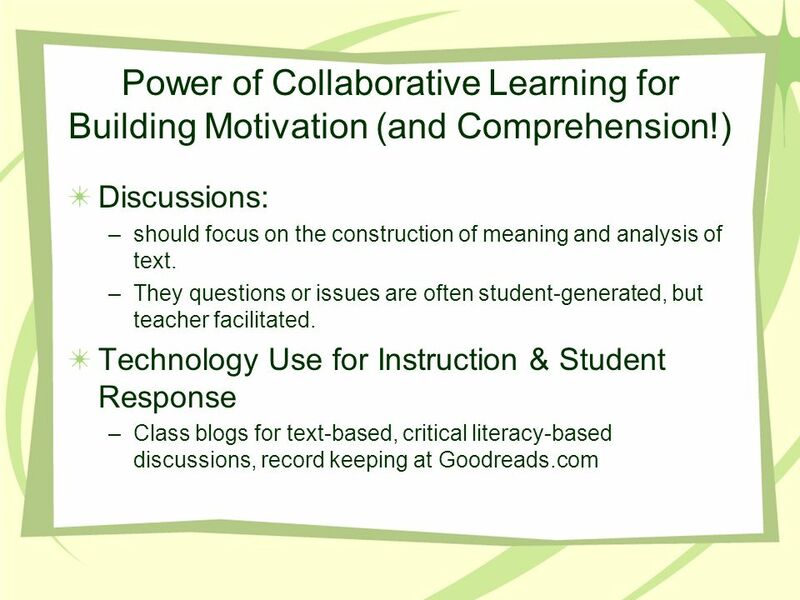 Provides a cooperative learning format, and uses small groups instead of large class discussion. Works best with material that elicits differing opinions or multiple interpretations. 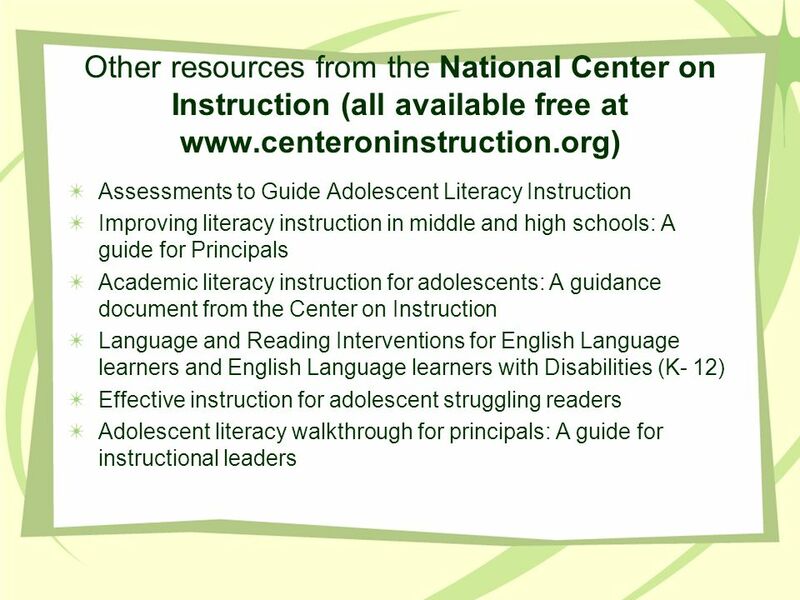 See handout in packet. 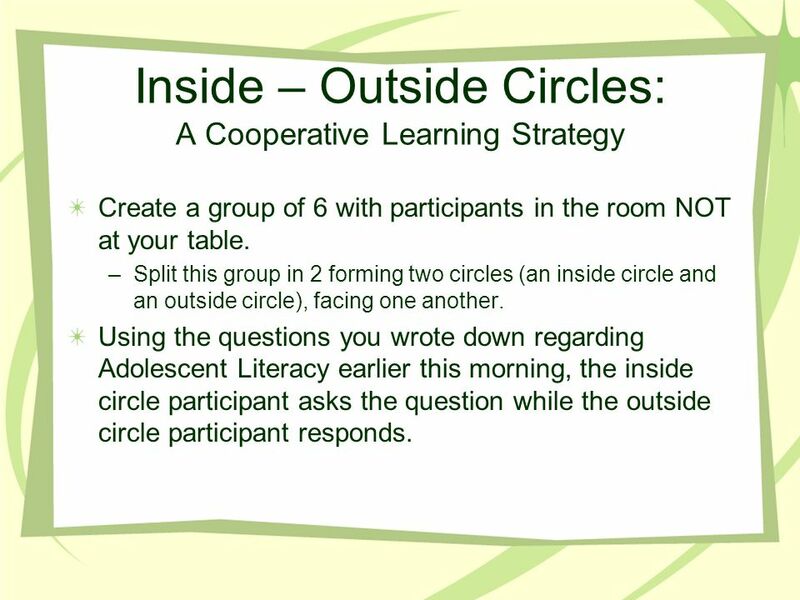 23 Inside – Outside Circles: A Cooperative Learning Strategy Create a group of 6 with participants in the room NOT at your table. –Split this group in 2 forming two circles (an inside circle and an outside circle), facing one another. Using the questions you wrote down regarding Adolescent Literacy earlier this morning, the inside circle participant asks the question while the outside circle participant responds. 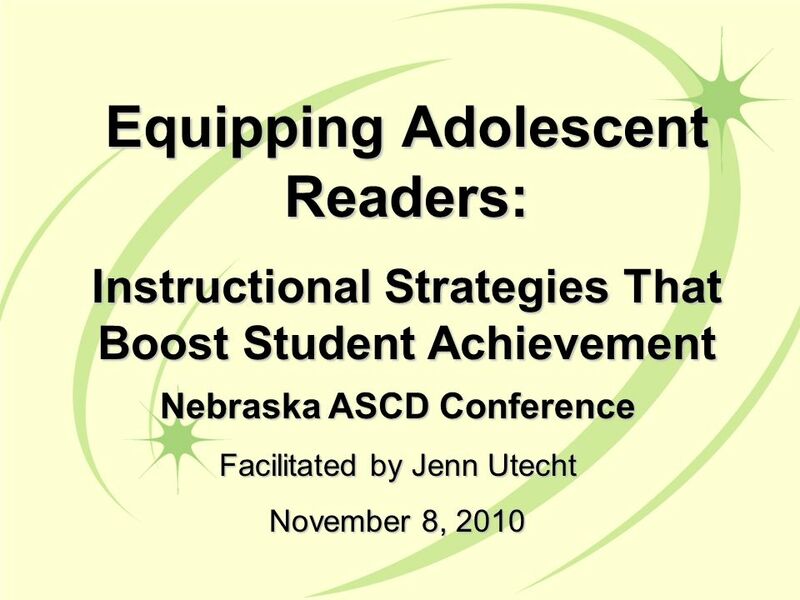 Download ppt "Nebraska ASCD Conference Facilitated by Jenn Utecht November 8, 2010 Equipping Adolescent Readers: Instructional Strategies That Boost Student Achievement." Leadership for Advancing Adolescent Literacy RESA-I 21 st Century Education Leadership Series October 21, 2008 Terry Reale, WVDE Coordinator Reading English. Week of Dec. 3-7 Vocabulary and Building Background. The Framework for Teaching Charlotte Danielson 4c: Communicating with Families 1 6/12/201 3. Critical Reading and Informational Text Virginia Arrington, MMS Kim Payne, CCMS. Why this Research? 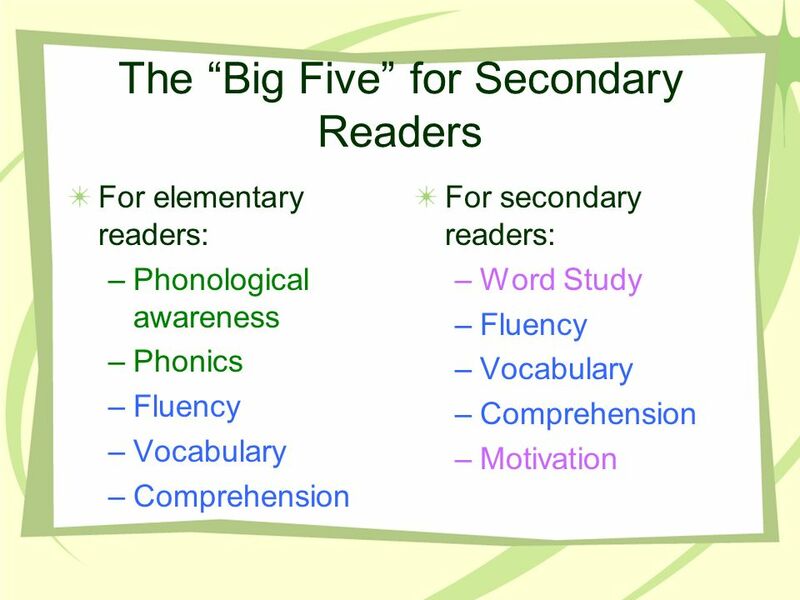 1.High School graduates are facing increased need for high degree of literacy, including the capacity to comprehend texts, but comprehension. ©Joan Sedita School-Wide Literacy Planning Grades 4-12 Joan Sedita. Purposeful teaching and Learning Improving Student learning.